(Nanowerk News) Cornell researchers have created an autonomous flying robot that is as smart as a bird when it comes to maneuvering around obstacles. Able to guide itself through forests, tunnels or damaged buildings, the machine could have tremendous value in search-and-rescue operations. Small flying machines are already common, and GPS technology provides guidance. Now, Ashutosh Saxena, assistant professor of computer science, and his team are tackling the hard part: how to keep the vehicle from slamming into walls and tree branches. Human controllers can't always react swiftly enough, and radio signals may not reach everywhere the robot goes. 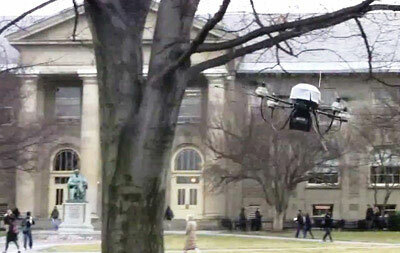 A flying robot avoids a tree on the Arts Quad. The test vehicle is a quadrotor, a commercially available flying machine about the size of a card table with four helicopter rotors. Saxena and his team have already programmed quadrotors to navigate hallways and stairwells. But in the wild, current methods aren't accurate enough at large distances to plan a route around obstacles. Saxena is building on methods he previously developed to turn a flat video camera image into a 3-D model of the environment using such cues as converging straight lines, the apparent size of familiar objects and what objects are in front of or behind each other -- the same cues humans unconsciously use to supplement their stereoscopic vision. Graduate students Ian Lenz and Mevlana Gemici trained the robot with 3-D pictures of such obstacles as tree branches, poles, fences and buildings; the robot's computer learns the characteristics all the images have in common, such as color, shape, texture and context -- a branch, for example, is attached to a tree. The resulting set of rules for deciding what is an obstacle is burned into a chip before the robot flies. In flight the robot breaks the current 3-D image of its environment into small chunks based on obvious boundaries, decides which ones are obstacles and computes a path through them as close as possible to the route it has been told to follow, constantly making adjustments as the view changes. It was tested in 53 autonomous flights in obstacle-rich environments -- including Cornell's Arts Quad -- succeeding in 51 cases, failing twice because of winds. The results were presented at the International Conference on Intelligent Robots and Systems in Portugal Oct. 7-12. Saxena plans to improve the robot's ability to respond to environment variations such as winds, and enable it to detect and avoid moving objects, like real birds; for testing purposes, he suggests having people throw tennis balls at the flying vehicle.